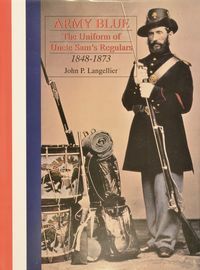 ARMY BLUE: THE UNIFORMS OF UNCLE SAM'S REGULARS 1848-1873 by John P Langellier. Hardcover, 350 pages with color images. Extensively chronicles the development and evolution of Regular Army officers and enlisted men's uniforms during the mid-19th century, and delineates the difference between official regulations and personal preferences in insignia, headgear, and footwear.